Orto di Casa Cecconi: Aching all over with a warm feeling! Aching all over with a warm feeling! The buds are bursting out of their scales on most plants, and the wind of the last couple of days was warm though quite strong: it blew away one of my greenhouse tents and down my greenhouse door (a blessing in disguise, really, as I found a couple of lost bits which had made it wobble for the last few months, and so I could fix it for good!). Even the sun made a timid appearance out of his permanent blanket of white clouds. 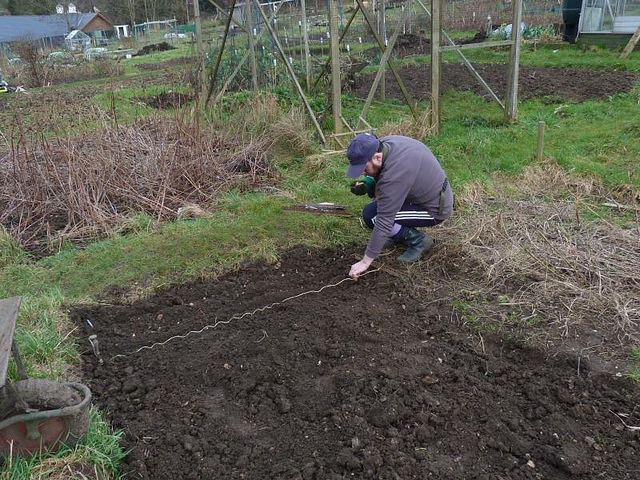 And more people are emerging from their winter hiding, and are busy around their plots. 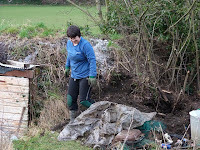 Feeling energised, I had a go at tackling the hill of rubbish at the bottom of hubby's plot - a hell of a big task: I dug out another 3 bin bags of rubbish, while removing a wheelbarrow or two of suckers, nettle and other weeds. 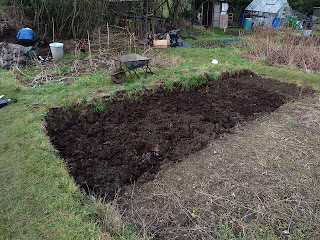 Up at my plot, my beds start to look pretty and tidy now. Both days I stayed until after dark, as in the good old times :) I feel very well but also extremely tired and all sore: it takes just a month or two without serious gardening to get me unfit: I am really getting old! ;p However, I found myself with a grin on my mouth whenever I stopped working. No sign of further digging from the rats: have they eaten the baits? I keep forgetting the butter, but I have also remembered why I had stopped using it: the resident fox would get the trap and bash it around until she managed to eat what was inside. 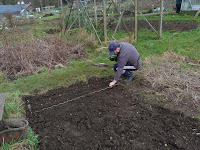 Hubby has been down with me all the time and managed quite a lot of work: he cleared a big strip of land, manured it (the soil was extremely heavy and compacted so I though it might be a good idea) and planted his first onions. I hope he enjoyed it. The technological type he is, Gianfry managed to think of a geeky gadget for the allotment too: he got us walkie-talkies to communicate when apart! I guess it is one of those thing that you hang on to from childhood for both of us, because I remember having thought of getting a pair myself a while ago. They work well, but I still prefer to walk from one plot to the other: it's good exercise! 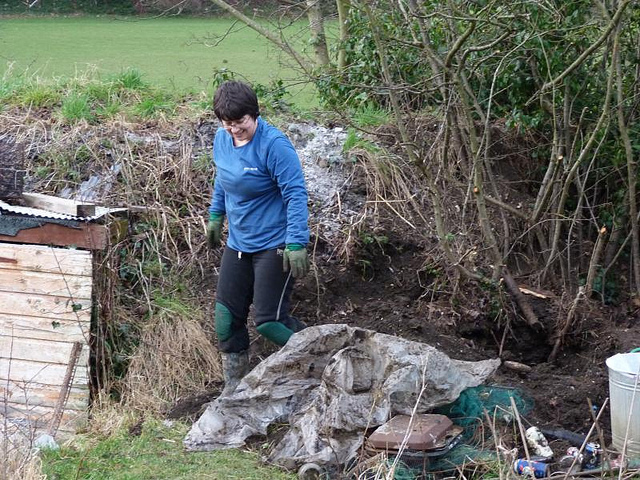 And it is nice to be both there on site, even though we soldiered through and didn't have much leisure together.